Maybe I haven't been totally clear on my love of Debby Hughes. But today, there will be no doubt...Her work is perfection. 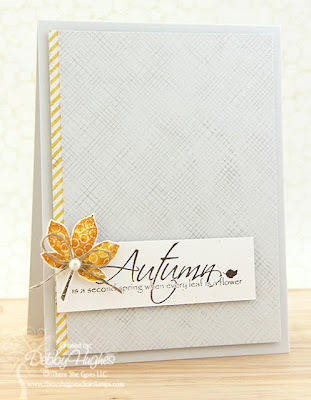 She chooses the perfect colors, stamps, sentiments, placement of gems and embellishments, basically I could go on and on. SO, when Case Study Challenge had a challenge to CASE my favorite DT member, I picked Debby. Now, I know the entire DT is fantastic, but there is a special place for Debby in this blogger's heart. The color, that patterned paper along the left side, the sweet twine and pearl, the faded background stamp, well it's just stunning. Before you check out my card, please know I AM NO DEBBY. I used my linen impression plate from Papertrey Ink to create the texture in the background, though it is hard to tell in the photo.For the patterned paper along the side, I opted for some washi tape. The sentiment is from Hero Arts called Cheer Up and the butterfly is also Hero Arts. Thank You for giving me a good excuse to CASE a Debby card. It was FUN!! Edited to add: I MISSED THE DEADLINE for the challenge! poo! Oh NO! On missing the deadline, because this is absolutely drop dead GORGEOUS! Your composition is fabby and I love the soft colour scheme that you've chosen, it allows your sentiment to POP! Oh I hear you... we can certainly be inspired... thankfully Debby has an ocean between her and us funny stalking blogland fans. Thanks for the well wishing on my card. Debby, Debby, Debby is right!! I love your CAS CASE of her card too! Soft pastely colors are oh.so.pretty! Wida I'm blushing and don't know quite what to say! Thank you so much for such support :) Your card is gorgeous as is everything you create! The washi tape is fab and that's something I've yet to really get to grips with. Oh and love the tone on tone butterfly. Once again thanks for the shout out.